I watched TOY STORY back at the end of January in an attempt to review the first two before finally seeing the third. Well, at last I got to the second. Hopefully it won’t take me until September now to get to number three! When ranking my favorite Pixar films, I usually place MONSTERS INC at the top. UP and WALL-E are up in that region too. And, certainly, the two TOY STORY flicks are in that upper echelon. INCREDIBLES, also. Well, really they are all magnificent. Only A BUG’S LIFE and CARS aren’t all time classics. I need to see RATATOUILLE again to make a decision there. But trying to rank them in an order is so hard. Part of the reason is that they, like so many films in these rankings, are good in different ways. I think the second TOY STORY is a better film, technically speaking, than the first. The transitions between scenes are razor sharp, the CGI has improved (albeit slightly), and the script is a precise, calculated marvel. Does it have all of the charm of the first? It has at least 90% of it. I watched it again tonight and was amazed at how quickly an hour and a half can whiz by when you are having fun (the technical precision of the scene transitions aids this as well). There is a great friendship built on the adventures of the first which carries into the second. 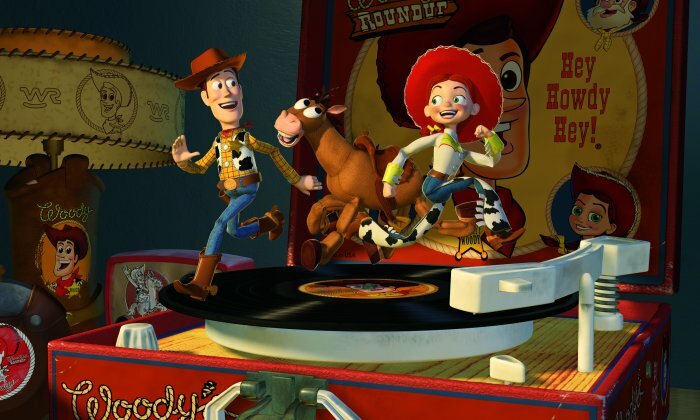 Perhaps the supporting toys are still a little too negative and questioning, even after all Woody and Buzz have proven, but that’s part of the charm too. These characters feel like friends who doubt, fight jealousy, and genuinely care. Yes this is a kid’s cartoons about toys being alive, but it is also a film about the value of friendship and loyalty, even when those whom you are fighting for don’t appreciate it. The homages to STAR WARS, JURASSIC PARK, Oddjob of the BOND films, etc., add to the joy of it all. Seeing Mickey on a clock wall, or the ball which appears in every Pixar film… those things just bring curious pleasure to those seeking it. These moments, especially the more subtle moments, aren’t necessary to the film’s success, but they speak to the attention to detail which goes into every frame. I love this film. I love Jessie’s song. I love the surrealistic and dangerous nature of the Buzz game which blows him away, and the nightmare Woody has. Both of these things happen in the first act, and both create a sense of ominous danger which the film tries to uphold. Sure it undercuts itself with the Buzz and his Dad segment (the conclusion, not the revelation, feels false), but this is a movie, a film, which really earns its place as a classic of the genre. ~ by johnlink00 on May 15, 2011.